Muskoka* is a top tourist destination. Actually, in 2011 it was listed as the top summer trip location by National Geographic Traveler Magazine. Known for it's lakes, Muskoka's population grows massively every summer filled with cottagers and tourists. The busy crowded summer can be something us small town locals grumble a bit about; however, we cannot deny that our tourist season provides a livelihood for a large portion of the area. I swear a good chunk of Toronto moves in every summer. Continuing to grow as a tourist attraction, it might come to you as no surprise that weddings in Muskoka are quickly becoming a top destination location. We had two visions for our wedding. Our first idea was to have an evening wedding, get married after dinner and serve fun food and just party and dance the night away under the stars. The second was the idea that we could perhaps make a weekend event of it. We explored the idea of making it a mini-vacation (especially for our out of town guests). Something like the Orca's are doing! Once engaged, we both started a search to see if we could find our perfect Muskoka location, which became a major two day searching quest. We knew we wanted an outdoor option, so we weren't interested in renting out some of the popular Muskoka resort destinations like Deerhurst, Grandview or Hidden Valley Resort. I literally spent two entire days on Google. When I'm researching something I become obsessive (much like Mrs. Squid!). When I can't find exactly what I'm looking for, I become determined. Mr. Narwhal too would come home from work feeling stressed that he hadn't thought of a location yet. We left no stone unturned to try and find a venue that would suit our vision. From summer camps, lodges, cottage rentals to barns, we looked high and low! I've decided to highlight some of the heavily considered options before I reveal how we came to our decision! First up was Pitman's Bay. This was our top idea coming into engagement. We live relatively close to Pitman's Bay, so we know that it's a popular wedding location (signs are posted all of the time). Typically rented in the summer from the Town of Huntsville for day camps, many people will rent the location on weekends for family events and weddings. You can rent the entire location for the weekend for the small fee of $645.00 (local fee). A waterfront location with shelter and bathrooms for $645.00! Yes you read that correctly. Well, you see, there's a catch (there always is). Since you rent from the town, bidding for the summer does not open up until March of that year. That means, your date and location is up in the air until March. We also found out shortly after getting engaged that you also cannot legally get a liquor license for your wedding, so you're putting yourself into some major risky territory with liability on that one. We decided it was time to scrap this idea and look for a better (less risky) option. 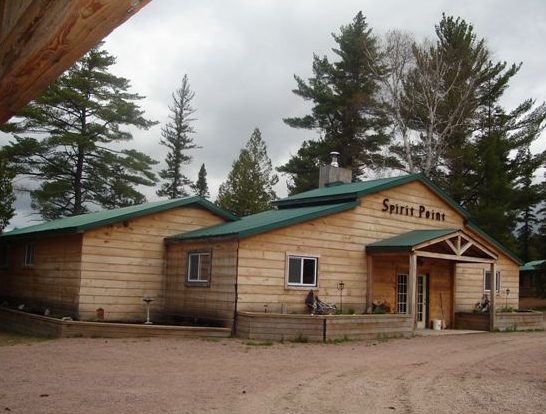 Spirit Point is located about a forty minute drive in Trout Creek, Ontario. You get a two night exclusive rental of Spirit Point with no maximum number of guests, and the ability to accommodate 68 overnight guests. The rental fee is $2000 per night. There is an additional cost of $35.00 per day per person for meals, not including the wedding dinner. They also recommend renting a tent, and all chairs, tables, china and glasses. In theory, Spirit Point would be an amazing event, but given the distance for those that wouldn't stay, and the amount of extras that would be associated with the rentals, we quickly decided to abandon this idea. My parents attended a wedding at Trillium and loved it! Trillium Resort is located in Port Sydney and a truly beautiful location hid away in the woods. My mom was a big fan of us exploring Trillium as an option. You have the ability to rent out the resort for the weekend, accommodating up to 60 guests over night and 130 for the wedding. While this was an option we would have loved to explore more, the limit of guests was a deal breaker for us. I discovered Brooklands Farm as a possibility over a year ago (i.e., when barn wedding were first becoming very popular). Located in Bracebridge, Brooklands presented a beautiful option outside of the resort world. A barn wedding wasn't exactly what Mr. Narwhal and I were searching for; however, it seemed like the option that was closest to capturing our evening wedding vision. I contacted Brooklands a day or so after getting engaged. They are quickly becoming a very hot spot for weddings and by the time I contacted them in mid-August they had two dates in 2015 left (funny side note: one of the dates was our actual wedding date). At $5250 for a two evening rental, we quickly decided that Brooklands was out of our price range, and not a viable option. Hillside barn is another population barn location in Muskoka, located in Dwight. Again, I felt like by the time I contacted Hillside I was scraping the bottom of the barrel, desperately trying to find a location where we could execute our wedding vision. Hillside costs $2500.00 to rent, not including any rentals and there is an additional fee of $500 if you decide to put up a tent (not including tent rental fees). The cost of a wedding at Hillside would quickly add up when you considered all of the rentals. Did you struggle to find a venue that fit your vision? *Muskoka is actually a district comprised of several small towns. Torontonians affectionately call it "the Muskoka's" and couldn't be more wrong about the pronunciation. Someone who calls Muskoka "the Muskoka's" immediately puts the tourist stamp on their forehead. Quite interesting. I never planned or attended rehearsal dinner in my life. I agree that finding a venue is must before thinking about party and so I have already booked one of beautiful venues in Chicago for dinner party of my brother marriage.